American Zombie: Got your canned goods? I'm not talking about hurricanes either. Referring to today’s press release on The IMB Report, Indymac’s company web site, an LA Times report refers to “a weekend that saw depositors line up at some of its San Gabriel Valley branches to pull their money, as they reacted to news reports questioning the company’s survival.” Indymac’s article responds with “while branch traffic is somewhat elevated this morning, it is substantially lower than on Saturday, and we are hopeful that this issue appropriately abates soon…” A thread for the ICLC shutdown has begun on our Discusssion Forum. Let's do the math...IndyMac may or may not be experiencing a run....they have 18 billion in deposits and are FDIC insured. The FDIC has about 53 billion in it's coffers to back it's insurees. One bank = One third of FDIC liquidity...and there are bigger banks teetering on the edge, i.e. Lehman Brothers, Wachovia, Bank of America, Citigroup, Wells Fargo, JP Morgan Chase, Goldman Sachs, Morgan Stanley......the beat goes on. The first real run...if it is happening on IndyMac....will trigger an FDIC seizure, which could snowball into a panic and runs on the larger banks...Lehman is probably in the most precipitous position at the moment. What's a poor FDIC boy to do? Super-quiet, stealthy seizures? Payment plan bailouts over multiple year periods? 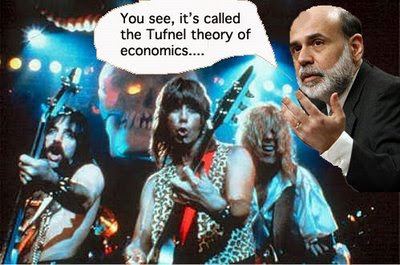 Bow at Bernanke's altar and hope he turns the Treasury printing presses up to a Nigel Tufnel 11? 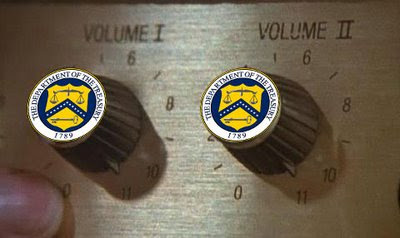 The Tufnel Theory of Economics in Brief : When currency valuations within a closed economic system have been exploited to the point of diminishing returns....invent a new magnification of said currency, step outside said closed system, and most importantly crank the motherfuckin' volume up! Everyone will be rocking out and enjoying themselves too much to figure out that one plus one no longer equals two. If anyone starts to notice the inconsistencies, feed them Johny Lilly strength acid, fire up the lasers, and show them Godel's incompleteness theorems. Worry about the hangover in the morning. Braver than the natives, who never heard of tea. They never knew what hit them, said the Spaniards later on. Empire. It was here and now it's gone. And the sun never sweats. No, the sun never sweats. You were younger than a virgin, older than the sea. You were angel, you were devil, and I was all of me. You knew you met your master, when I made you stay at home. Woman. Whatever made you roam. Even the hardest concrete never quite sets. Losing is for losers, winners play to win. Always love the sinner, you may even like the sin. The door that used to open has closed without a crack. Woman, you're like the Empire and I still want you back. We may be gods or just big marionettes. But the sun never sweats. Life is a gamble and we're all placing our bets. And the sun never sweats. No the sun never sweats. You see any sweat beads on Bernanke's bald dome? Anyway...as of tomorrow, I'll be on the other side of this pale, blue orb....literally. If the country goes to billy hell, somebody send me an email...and pictures. I'll send you guys pictures and updates of the wonderful new Halliburton headquarters built with American tax dollars and lives.